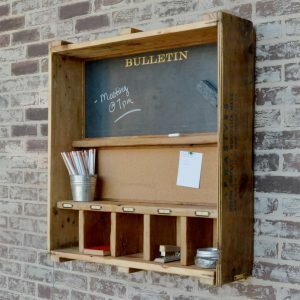 This unique wall organizer chalkboard is made from half of an old shipping crate. Original writing and / or logos are intact on the sides. 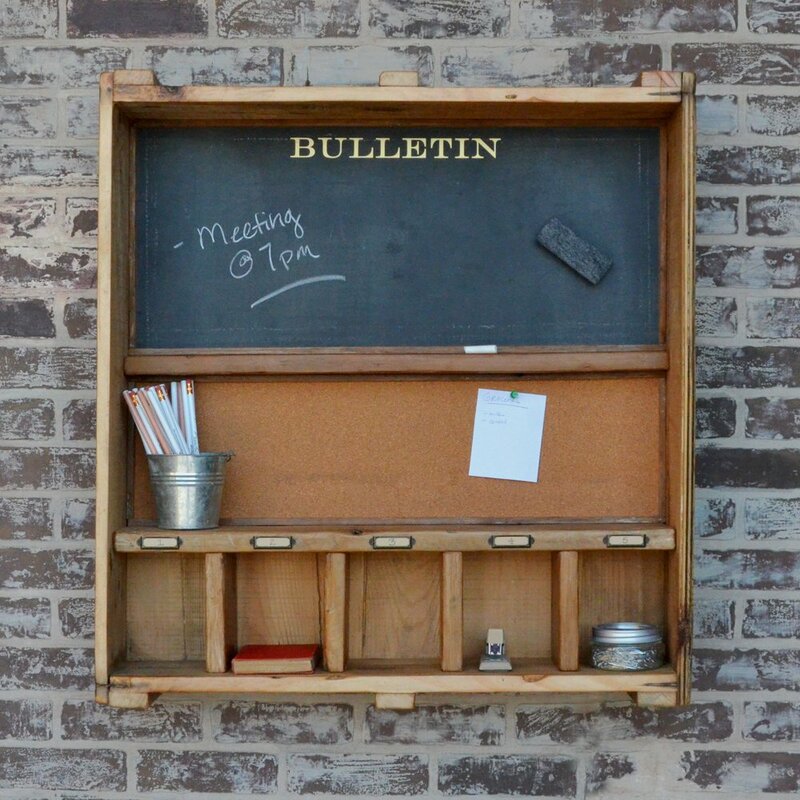 Add rustic charm to your home, while organizing loose notes, messages, and office supplies! 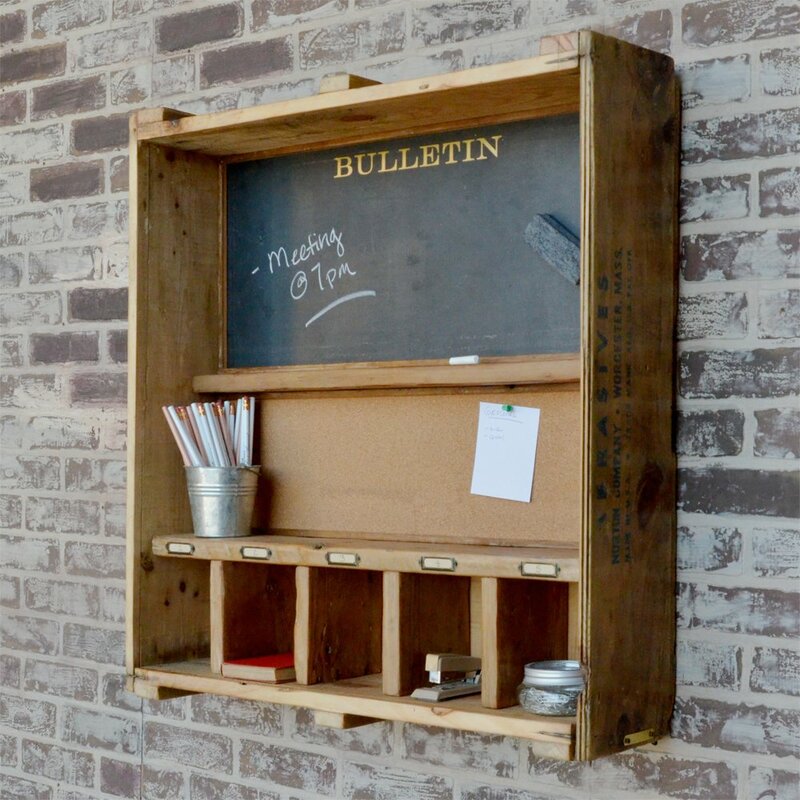 This wall organizer chalkboard is made from half of an old shipping crate. 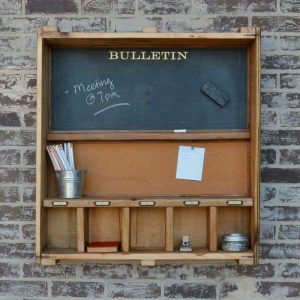 Reclaimed chalkboard, bulletin board, and handy storage compartments pack function into this stylish piece! 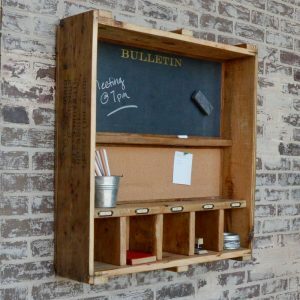 This unique organizer will add function and charm to your office, kitchen, or other workspace! Sales tax is added to Illinois sales at the rate of 6.25%. 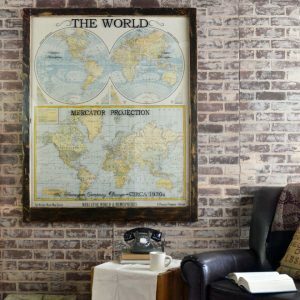 Products are shipped via UPS ground or by freight truck. 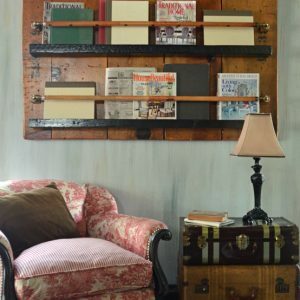 Chicago area customers may inquire about discounted local delivery. Typical transit time for UPS shipments is 1-4 business days; however, this may vary. Products requiring freight shipping will likely require additional time. You will be provided with a tracking number via email after your order is placed. We may contact you with additional information or to coordinate large freight shipments. 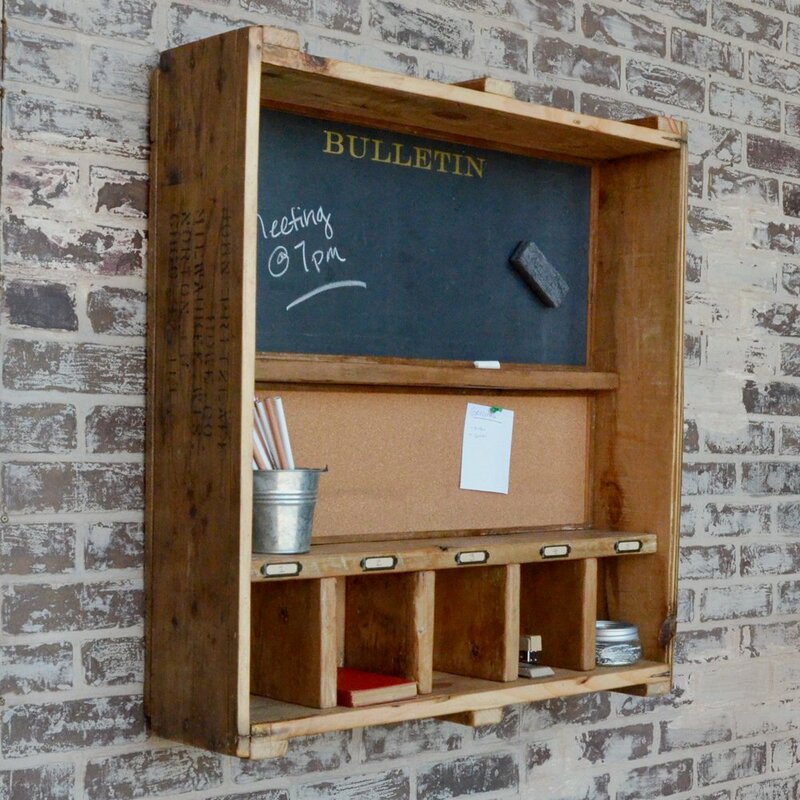 Our products are made from reclaimed materials and variations should be expected. We do all we can to ensure your satisfaction with our artwork and customer service. However, if you would like to discuss returning an item, please send an email to allow us an attempt at first resolving the issue. All returns are subject to prior approval. Please do not return an item without authorization. Original shipping charges will not be refunded. All returns must be received back within 14 days of the receipt of your item(s). Return shipping fees will be at the customer’s expense. Once an item is received, we will refund the item’s purchase price or provide a suitable replacement. 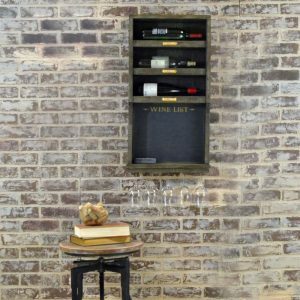 Second Chance Art & Accessories is not responsible for damage that occurs during shipping. 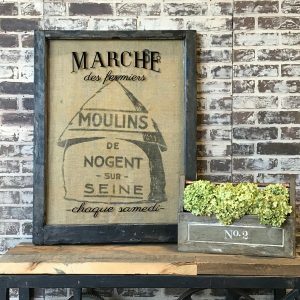 All products are insured for the retail value plus any applicable sales tax. If an item is lost or damaged in transit please let us know immediately and we will file a claim with UPS or the shipper used to originally ship your item and issue a refund or send a replacement once the claim is settled. Second Chance Art & Accessories ships products using UPS ground, blanket wrap movers, and/or freight shipping companies. The carrier used for shipping will depend on the products ordered. Every effort is made to pass along cost savings with shipping when possible. Typical shipping costs for a four piece order, shipping via UPS ground, is $90-$200 – depending on distance traveled. Most catalog items can be shipped via UPS ground. 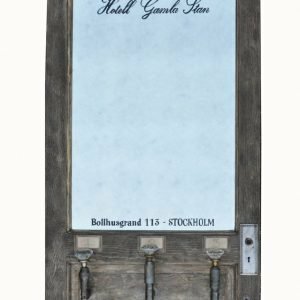 Some larger window artwork and one of a kind items may require freight shipping. Typical freight packing / shipping costs are $500-$1000, depending on distance traveled and if crating is required. There is significant cost savings in shipping multiple items together in one shipment. Smaller items (normally shipped via UPS ground) may also be combined with a larger item (requiring truck shipping) to pass along cost savings. If you have a preferred carrier you would like us to use, please let us know so we can coordinate this. We are happy to provide a shipping estimate for you prior to purchase. Please contact us with your shipping address and specifics of the items you’d like to order for a shipping estimate. Sometimes an order may consist of items with different ship dates. We are happy to ship the portion of your order that is ready separately from items that may require more lead time. If you prefer to wait and ship the entire order when ready, we will accommodate your request. 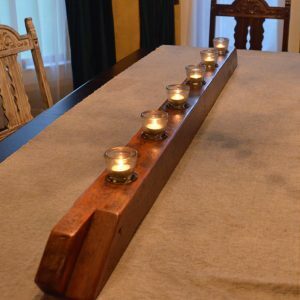 Second Chance Art & Accessories will invoice you when your order is nearing completion. Shipping charges will be added to the invoice. We will contact you for approval prior to charging any invoiced amount. Once an invoice has been paid, we will ship your order and provide a tracking number. If you have an account with a specific shipping company and would like to handle shipping charges directly, then we will just invoice the amount of the order (without shipping).